The US Geological Survey (USGS) has the stated mission of mapping the United States. That was one of the foundational roles of the USGS, and it is a role they took on with an almost missionary zeal from the beginning (the USGS was created in 1879 by act of Congress). USGS set the standard for large scale (i.e., small area) mapping, and their 1:24,000 series topographic maps of the United States are classics. These are the 7.5′ x 7.5′ quadrangle sheets, commonly known as ‘quads’. These quad sheets have been used to teach generations of Americans the basics of map reading, terrain association and land navigation. They have guided millions of hikers, orienteers, foresters, researchers, explorers, search and rescue personnel, hunters, fishermen, campers and canoers for over 100 years. USGS maps have, literally, served as the background to America’s love of the outdoors and her expansion and growth across three centuries. In the old days about the only way to get USGS topographic maps was to order them directly from the USGS or purchase them from a limited number of authorized sales outlets like camping supply stores. You can still do that if you like – a single USGS 1:24,000 map will run you about $8.00. Not cheap, but not bad for a high quality map printed via lithographic processes. But this is the age of the World Wide Web, instant gratification and free data. The USGS has happily obliged us by putting virtually its entire inventory of topographic map products – at all scales – on line for instant download. The USGS online store offers an easy to use map search function under the Map Locator link. You can search for a particular map by address, place name or simply by picking a point in the map in the Google Map window. Using this process you can either purchase the paper map or download a free digital copy. The free digital map is a scanned copy of the original paper map in Adobe PDF format. The scan quality is good – not as good as the original paper map, but pretty darned good for a free product. These maps can be opened and read using the free Adobe Acrobat Reader application. As an added bonus these maps are delivered in GeoPDF format. This means that the geographic extents of the map have been embedded into the digital map file. If you want to take advantage of this geospatial functionality you can download the free TerraGo Technologies plug-in for Acrobat Reader (available from a link on the USGS Map Store website). 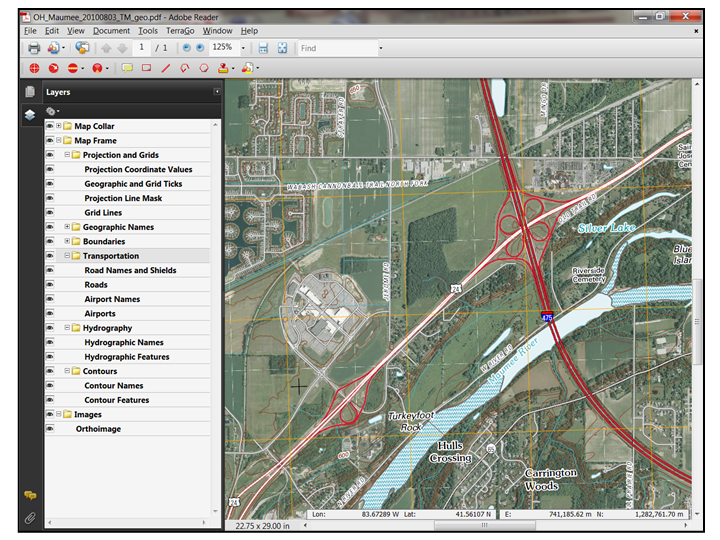 With this plug-in you can set the coordinate system of your choice (i.e., latitude/longitude, UTM, etc.) and select coordinates for features of interest, measure distance and area, measure azimuths and, if you have a compatible system you can link these digital maps to your GPS and use them as your navigation background. But it gets even better! The functionality I just described is specific to the old generation of scanned paper maps. The USGS is producing an exciting new generation of 1:24,000 quadrangle maps known as the US Topo series. These maps have the same geographic extents as the traditional quadrangle maps, but instead of being created by traditional cartographic methods the US Topo series are created using aerial imagery or satellite imagery as the map background. This allows maps to be produced and updated much faster than the old traditional cartographic methods allowed. In many places of the US the traditional quad sheets have not been updated for over 50 years! The technology behind the new US Topo series of maps allows for much faster updating. As an added bonus (I think I’m starting to sound like Billy Mays here), since the US Topo maps began life as a purely digital file (they are created using a program called ArcGIS) the production process allows even more functionality to be embedded in the map file. Users of US Topo series maps will be able to manipulate virtually all of the data embedded in the map, turning data layers on and off. If you have a copy of Adobe Acrobat (not just Reader) you can make annotations directly on the map, adding comments, symbols and basic sketches. Zoomed in view of the US Topo map of Maumee, Ohio (my home town). Using the table of contents on the left you can turn data layers on or off. Northwest Territories (Ohio, Michigan, Indiana) to American settlement. The battle site is the large patch of woods in the center of the map image. Bottom line – this is all good stuff, and it’s free. Go get it! This entry was posted in mapping and tagged usgs by Brian Haren. Bookmark the permalink.